Every day thousands of people are trying hard to reach your business but they just can't succeed. They keep on looking for you in the search engines, but instead they run into those nasty competitors of yours who managed to make it to the top of search engine listings. As a result, you lose a great number of potential clients without even knowing about it. How could that happen? — Well, your competition did something called SEO or Search Engine Optimization. This is a promotional technique that makes websites appear at the top of Google, Yahoo! and other search engines whenever someone types in a word or a phrase. Search engines can bring millions of people to your website daily. But that is only when you rise to the top in their rankings. Hi, my name is Dan Richmond. I'm a professional SEO and we're going to take revenge on your competitors winning back your pride and customers. You don't need a gun. Your only weapon will be my SEO guide called SEO in Practice. And, believe me, this is the biggest SEO barrel you could possibly get. It's powerful, accurate, safe, and 100% free. Armed with real-life tested techniques from my SEO arsenal, which I've been collecting for 8 years, you're gonna smash your competition in search engine rankings. 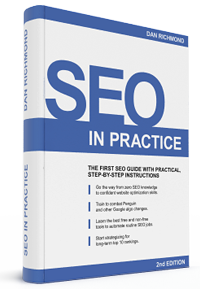 The unique concept behind this SEO book is that it is based on a fully practice-driven approach. Once you've gained a new skill you don't wait a sec to use it and reap the benefits. The sooner you start off with your SEO campaign the faster your results will be. "Be fast or be dead", runs the old saying of SEO professionals. From this guide you will learn how to become the fastest guy in the whole of Wild Wild Web. SEO in Practice is the only SEO guide that gives detailed advice on how to accelerate your SEO efforts a dozen times with the help of special SEO software. There's still another feature that singles out this book. SEO in Practice doesn't require any background knowledge. Even if it is the first time you've heard about SEO you'll have no trouble digging it. You'll have detailed step-by-step guidelines to follow so that you know exactly what you're doing. There are a lot of images to help you get a better idea of the process. Each section of the book ends with a quiz. Having successfully completed all quizzes you get a special SEO Certificate. 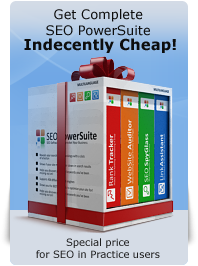 So, after finishing the course you become a certified SEO specialist. What's even more important is that during the course you'll be putting your newly-gained knowledge and skills into practice. Thus you'll be driving your website up in search engine rankings generating a hell lot of traffic and boosting your sales. So, let's hit the rankings!